I have been studying the law of Attraction for a few years now and I am always coming across new techniques to try. However, I typically stick with a few manifestation exercises that I have found to actually be successful in my life. 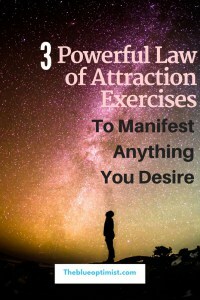 If you are looking for some new law of Attraction and manifestation practices to try out, keep reading to learn about 3 Powerful Law of Attraction Exercises to Manifest Anything You Desire. The Three Sticky Notes Sandwich- I am not sure what this technique is actually called and I cannot remember where I even found this concept. But here’s how it works: Make a list of 10 things you would like to manifest. I like to write them out in the present tense. For example, “I am driving a new White Jeep.” (Because I just love Jeeps. Ha) Then circle 3 things from that list that you would like to focus on first. Write each of these 3 things on 2 separate sticky notes, (one desire per Sticky note). You should end up with a pair of each desire for a total of 6 Sticky Notes. Place one set of the 3 at the head of your bed and the corresponding set of 3 at the foot of your bed. Now all you have to do is leave the stickies there. Once you have manifested the item on the sticky note, you can replace it with something else from your list of 10. I found that this exercise has been one of the most effective for me when trying to manifest something very specific. It seems to especially be effective when trying to manifest material items. White Light Energy Visualization- Retreat to a quiet area where you can spend about 5-10 minutes alone. Close your eyes. Take 3 deep inhales and 3 deep exhales, releasing any tension and stress. Now, imagine yourself traveling upward- through the roof, into the sky, through the clouds, and up into the galaxy. Visualize yourself floating through this dark galaxy, occasionally passing by bright stars and planets. In the distance, you see a bright ball of white light. As you travel closer to this light, its image grows in size. Finally, you reach this brilliant ball of light and you pause in front of it. Visualize images of a very specific desire flowing into this ball of light, as you watch it grow bigger and more intense. Finally, visualize this powerful sphere bursting into billions of tiny little pieces dispersing out into the universe. Open your eyes and receive that energy. The universe has received your request and is turning it into a physical manifestation. Pray Rain Journal- Pray Rain Journaling is another really powerful law of attraction technique, and is definitely one of my favorites. Here’s how it works: Get a journal , a pen (I prefer to use blue for these exercises but really any color should be fine), and a few minutes alone. I recommend having a separate journal for different areas of your life (Money, Health, Relationships, etc. ), or just sectioning off your journal for each subject. In each section, write out your daily journal entry pertaining to that area of your life. Be sure to write in the present tense and include vivid details as if you have already experienced this moment. For example, “I love waking up each morning next to the love of my life! This morning, we spent the first hour or so of our day just laying in the bed enjoying each other’s presence. We then worked together on a delicious breakfast alongside our three beautiful children. We thoroughly enjoy cooking together as a family, especially before dropping the kiddos off at their grandparents’ so we can run off to our monthly couple’s retreat.” You can jot down whatever exciting story comes to mind. Remember, it is all written in the present tense. This exercise really works on training the subconscious to believe that your desire has already manifested. There is also that added bonus of building up that excitement as you write about the experience. This is a very powerful law of attraction exercise. There are many other really great law of attraction/manifestation techniques out there, but these are 3 that I have tried myself and found much success with. I have even found that I am manifesting things in a very short period of time just using these techniques. It really is amazing. As always, if you do not have faith that these techniques will work for you, then they likely will not. You have to believe in the power of these exercises in order to reap the benefits. Lastly, HAVE FUN with it and remain open-minded- it makes life a lot less stressful. What manifestation exercises do you like to use? What exercises have been the most successful for you? Please share in the comments!